Congratulations to our Stillwater Area High School students who earned academic letters for their school work! Letters were presented to 505 students who earned a 3.75 grade point average and above during the 2016-2017 school year. Of those students, 87 earned a perfect 4.0. Sixth graders at Oak-Land Middle School are really digging their Minnesota Studies class with teacher Derek Olson. 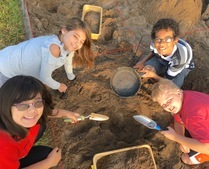 Students got down and dirty as they dug up artifacts from different time periods and cultures in Minnesota as part of a unit on how we learn about the past. See more photos on Facebook. 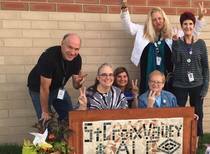 Students and staff at the St. Croix Valley Area Learning Center celebrated International Peace Day with art, poetry, speakers and song. See more photos on Facebook. Skip the call. Report absences in Skyward. If your child is going to be absent from school, please report it using Skyward Family Access. This is fast and easy for you and more efficient for school staff. You can access Skyward online, or better yet, download the free app to your phone. Just search for Skyward Mobile Access wherever you get your apps. You can be among the first to join the Pony Activity Center (PAC) at Stillwater Area High School and take advantage of the indoor walking track, weight room and cardio room, and gymnasium spaces. Adult memberships start at just $10/month for a track access only, and $20/month for full access. Health care reimbursements may apply. There is no initiation fee and no long term commitment. Register now! Tickets are now on sale for the upcoming high school performance of Grease! Call the Ticket Hotline at 651.351.8109.